I moved to Rio Rancho, New Mexico USA in May 2005. I had just retired from the USA Navy after being on 9 ships and three specialties for just over 20 years of honorable service. I was born in EL Paso Texas April 24 1966, Graduated High school at EPHS class of 84. Being new to the area and not knowing anyone, I was on the hunt for a new therapy for my military disabilities. 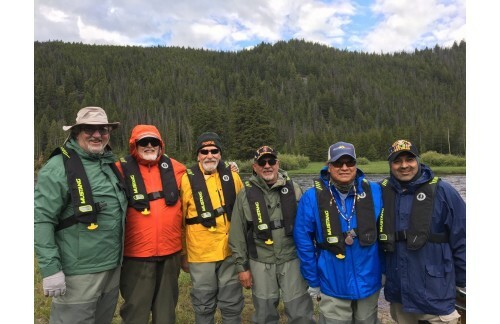 I made friends with another veteran that was a member of Project healing Waters New Mexico and he invited me to a Fly Tying class and from that moment on I was hooked to western fly fishing Czech nymphing and Tenkara I was already doing from my journeys to Japan while in the Navy. I caught my first trout and immediately fell in love with the sport! Especially since I was no longer having to purchase flies I was catching on my own ties. I went home and watched videos, practiced my casting in a park and did all the PHWNM instructors and volunteers asked of me.. I continued to fish nearly every day and learned as much as I could. Then my challenge of being able to catch a single fish gradually shifted to the constant desire to catch the biggest and the most caught and released fish in a day! I started to buy MAXCATCH products on the web and I fell in love not only with the products I was using, but with the community I had become a part of. MAXCATCH is not just a brand or product - it is a lifestyle. I'm proud to be a part of a community of anglers who love this same Sport/lifestyle while constantly supporting, encouraging and teaching one another." I want to thank MAXCATCH because thank to them I am able to continue to fish even with my disabilities. I still fished last year 300 MAXCATCH days.